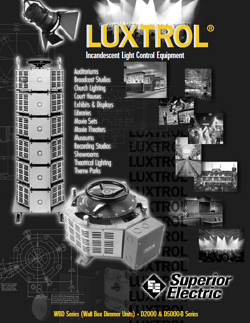 LUXTROL Light Controls described in this catalog are extensively used for incandescent lighting in residential, theatrical, institutional, commercial and industrial installations. All dimmers are continuously adjustable transformers that control light intensity by controlling the voltage applied to the lamps. Moving the dimmer control knob or actuating the drive motor moves a brush-contact over a bared portion of the transformer winding producing any desired lighting intensity from complete darkness to full brightness.